Passing by a window display, staring at the faceless mannequin, a sense of wonder touches me. Why most of the time that faceless thing wears an outfit classier than mine. That awkward moment when it can pull off an outfit better than i can. So i tried to fit in all the sizes, trying so hard to replicate that thing and suddenly end up buying just to boost my self esteem. That moment when i thought that fashion is all about name and not feelings. How can a faceless emotionless mannequin tell me what’s good for me and what’s not? I look into it and i suddenly see myself, a clueless expression covering my real emotions. The inner voice whispering that fashion is you, only if you truly feel it, not how others see you nor on how the trends define you. Fashion is never wrong. It’s like the clouds that change its shapes and the sky that changes its color. To be engulfed by it is like eating a cake and licking an ice cream. Some days they’re so sweet, some days you don’t feel it , not because your mood dictates your taste buds but only because you think time is the culprit. It changes as fast as that ice cream melts long before it touches your lips so you better have it. So different from Art that time is not a chief antagonist but a friendly ally. Fashion is an art, but art can never be fashion. Art is timeless. So next time i look at the faceless mannequin and see a beautiful window display, i just smile. I know i will never be Fashion. I will always be an Art. Copyright © 2014 Joys of Joel by Joel F. All Rights Reserved. Sometimes we forget to appreciate The Gift of Time. “Massacre! Germany cuts Brazil to pieces to advance to World Cup Finals.” Catchy Title, Painful Words. That’s how i see it when i got hold of a local daily featuring the World Cup Event blow by blow. Now of course it’s all over the net what happened at the World Cup semi-finals. Brazil being crushed at their home turf and worst of all seeing their bitter rival Argentina reaching the finals. Netherlands being defeated by Argentina (thanks to Argentina’s goalkeeper Sergio Romero who was once groomed and trained by Netherland’s coach Louis Van Gaal (How Ironic!). “Penalties are always a matter of luck, and I taught Romero how to stop penalties so that hurts,” uttered by Netherland’s coach Van Gaal. Life is really full of ironies, No way would he ever imagine that someday his protege would crush his own dream. And yes, it hurts, one can see the pain not only on the players and coaches but also on the spectators, watching and rooting for their teams, their country. 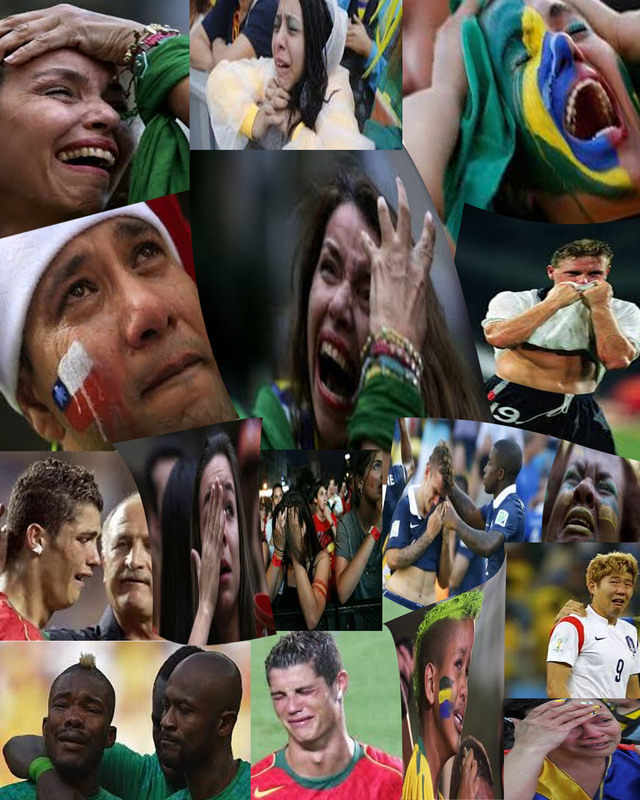 You watch the World Cup and you can see tempers rising, emotions surging to a feverish squeal. No wonder it’s called Fever, World Cup Fever. This brings me to the following question: Why is it so painful to lose? Well, different reasons for different people. Hard Work and Expectations. When you work so hard for something and you didn’t achieve what you want, it wounds you. When something you expected or wish never happened it kills you. But just like all things that happened in the past, after that gloomy day, you learned to move on. Time heals all wounds they say. When the pain subsides, you learned to leave the past behind. Just like the World Cup teams, come four years later, they’ll fight again and no matter what happened in the past, they’ll keep on fighting. Galileo once said that the world is round, yes life defines the shape of the world … sometimes you’re up, sometimes you’re down but as long as you keep kicking, keep that ball rolling, keep going for that goal no matter how many penalties life throws at you (for the mistakes you’ve made) , you can still get that Cup, with or without fever! – By Joel F.
How does traveling change us? Let me count the ways. 1. It opened our eyes. We see things we never see before or things we pretend we’re not aware of. 2. It turns us into a storyteller. 3. We discover something about ourselves. We all want to share our photos, where we’ve been, what we ate, what we did ,not just to our family and friends, even to strangers….as if we are always the center of other people’s universe. Can’t blame us, we’re all humans…needing validations and a sense of happiness , always thinking that something worth doing is worthless unless being shared. A little peek into our travel journey and we discover, inside us, there’s a tinge of narcissism. I remember an old friend saying “you can see how lonely a person is by the number of times he indulge in selfies.” I definitely beg to disagree, happy people want more happiness by sharing their happiness. Well, of course there will always be an exception to that rule. Most of us would rather share our experiences than our savings, i don’t think that’s narcissism and even if it is…..who cares? Love begins within , whatever that means. “I don’t have time, i’m too busy. The truth is we all believe that we are the master of our fate and the captain of our ship and yet we never learn that time must be our slave and not the other way around for how can one say that we make our own life and yet we don’t own our time…that confused me. In any way one defines it, i learned that we learned the essence of time when we travel. Either it transformed us into grateful beings for appreciating all the things we have or unsatisfied creatures yearning for more. A certain writer says “it leaves you speechless” , yes, speechless because you realized that traveling is not about the places you’ve been to but the moments you discover that the journey begins and ends within you. .
Kindly Click This To Read The Boat Ride. Thanks.